What Does Code C1446 Mean? OBD II fault code C1446 is a manufacturer specific code that is defined by carmakers Ford, Lincoln, Mercury, Mazda, and Jaguar as “Brake Switch Circuit Failure (ABS Module) Open or Shorted to Ground”, and is set when the PCM (Powertrain Control Module) on these applications detects an open, or, short circuit in the control circuit of the brake switch. The brake switch is sometimes also known as the “brake light switch”, “brake pressure switch”, or “cruise control deactivation switch”. NOTE: Code C1446 typically sets when the PCM detects an “ON” signal from the brake switch for about six consecutive minutes while the vehicle is being driven faster than 12 m/ph, or, when a continuous “ON” signal from the brake switch is detected even when one or more control modules detect that the vehicle is actually slowing down. On modern applications that are fitted with ABS brakes, stability -, traction control, and other safety systems, the brake switch performs two functions. The first is that activating the switch by depressing the brake pedal illuminates the brake lights; the second is that by activating the switch, the PCM, and other control modules are alerted that the brakes are being applied. While the need for the first function is self-explanatory, the second function is essential for safe vehicle operation. For instance, if the cruise control system is in operation, it cannot be deactivated by momentarily depressing the brake pedal if the brake switch or its control/signal circuit is defective, since both the PCM and ABS control modules depend on the brake switch to receive accurate input data in order to be able to deactivate the cruise control system. Thus, if the relevant control modules do not receive an input signal from the brake switch, or if one or more control modules receive an input signal, even though the wheel speed and/or other sensors detect that the vehicle is decelerating, the cruise control system will remain active, unless it is deactivated manually. Moreover, if the brake switch or its control circuit is defective, it may be impossible to move the gear selector out of “P”, on many, if not most applications, since the gear selector lockout switch requires a signal from the brake switch to release. 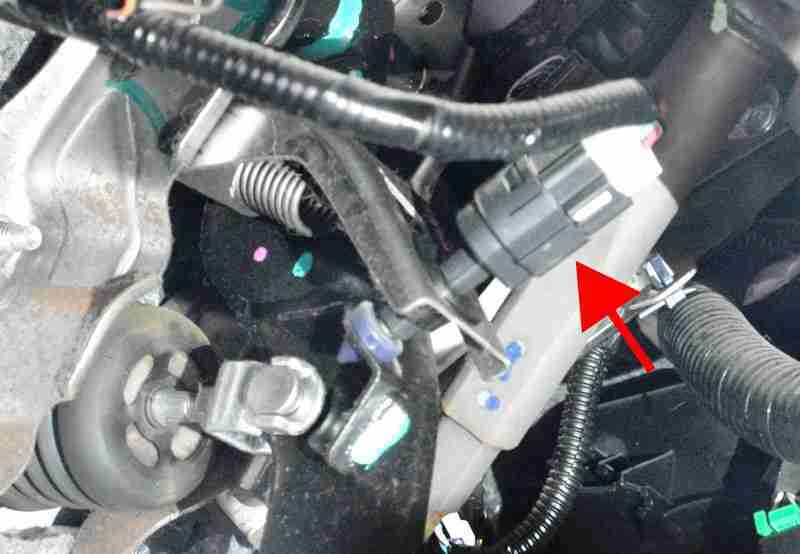 In terms of operation, the brake switch is a simple “ON-OFF” switch that is most commonly located on the brake pedal, and always supplied with current on one terminal. Depressing the brake pedal allows moving parts in the switch to close a circuit, which then supplies current through the switch to the brake light circuit(s), various control modules, as well as to the gear selector safety lockout switch via separate terminals on the “current out” side of the switch. Thus, should the PCM or other control module detect an open circuit, short circuit to (battery negative), or a general malfunction in the switch and/or its associated circuit(s), code C1446 will be set, and an ABS warning light may be illuminated as well. Where is the C1446 sensor located? The image above shows the typical location of brake switches on most applications. Note though that on some Ford and VAG-group applications, the brake switch may be located on the brake master cylinder, instead of on the brake pedal. What are the common causes of code C1446? One or failed or failing control modules, including the PCM, ABS/stability-/ traction -/, and cruise control module. Note that control module failure is rare and the fault must therefore be sought elsewhere before any control module is replaced. WARNING: Be aware that if the Dynamic Stability Control module is replaced on any Mazda application, great care MUST be taken to ensure that the module is integrated / installed in strict accordance with the manufacturer’s specified procedure(s). Failure to observe all instructions will almost certainly result in the module either not working as expected, or not working at all.